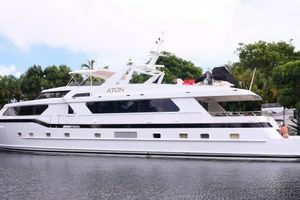 United Yacht Sales New Jersey would love to guide you through a personal showing of this 108' Broward Motor Yacht 1995. 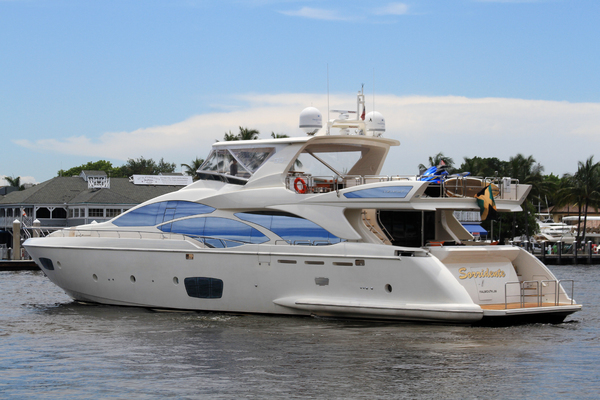 This yacht for sale is located in Fort Lauderdale, Florida and priced at $1,750,000. For a showing please contact us by filling out the form on this page and we will get back to you shortly! 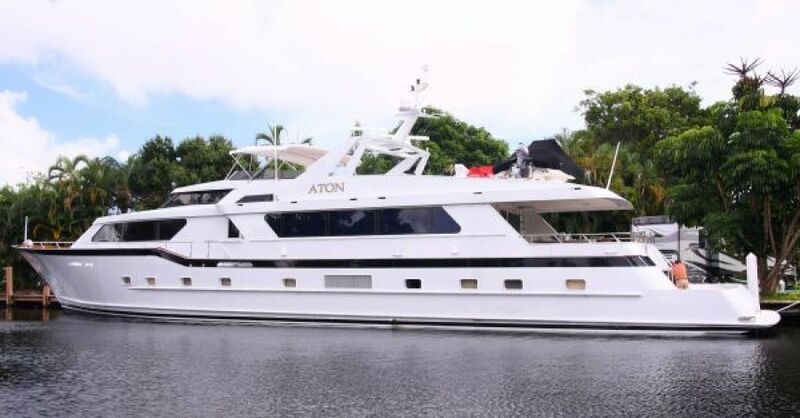 ***PRELIMINARY LISTING*** ATON is the typical Raised Pilothouse design of the early to mid 90's. She has a few different features of the era like a forward and private dining salon and a larger main salon with separated seating areas. Two stairwells in the salon, one aft and midship serve the stateroom areas. 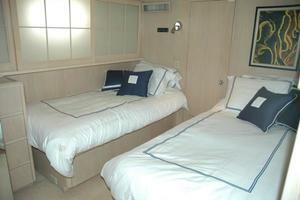 There are four staterooms sleeping nine people and a nany/child's stateroom accommodating two more. 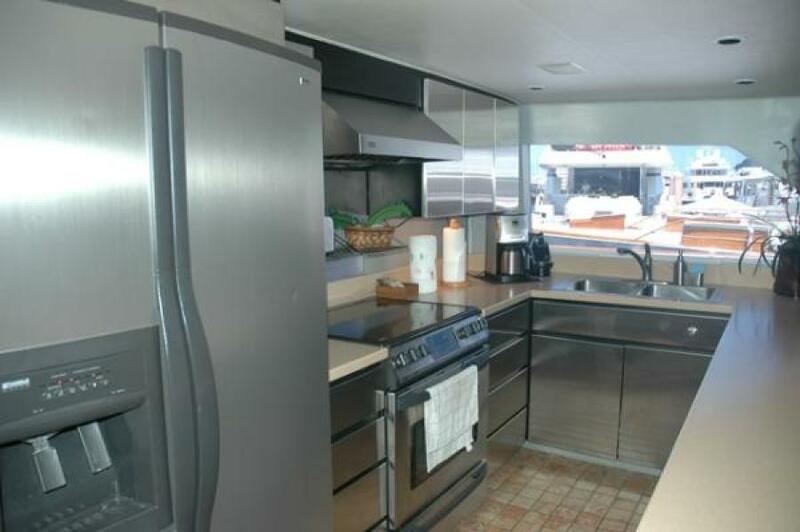 The crew has separate quarters forward and there is a crew access door in the galley to starboard. ATON has a very large aft deck with a ladder access to the flybridge. Access to the new 2010 cockpit extension is through a center ladder stairwell. 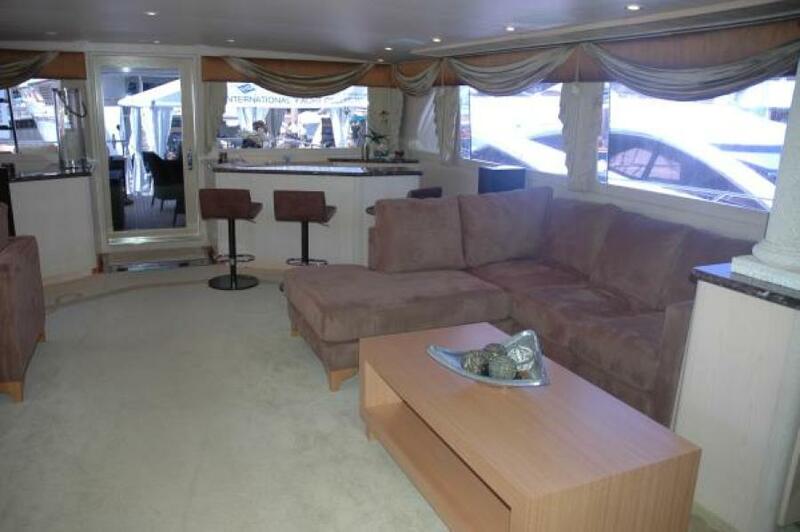 Entering the large sliding door from the aft deck is the U-shaped wet bar to port. 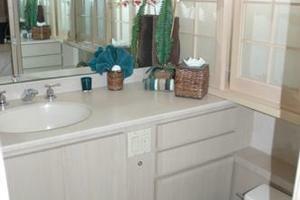 Travertine marble countertops and under counter icemaker and sink. To starboard aft is the semi circular stairwell to the aft guest accommodations. Hidden in the Travertine marble cabinet is a pop up TV for the aft salon seating. Opposite facing sofas on port and starboard are separated by a large coffee table. Occasional chairs flank the table, dual faux columns provide a buffer to the forward seating. Cabinets house the audio equipment and miscellaneous serving ware. 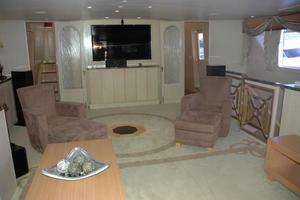 The forward bulkhead has a 46’ flat screen TV and cabinet storage under. Faux columns accent this area. A privacy door to port provides access to this port forward sidedeck doorway and umbrella closet. 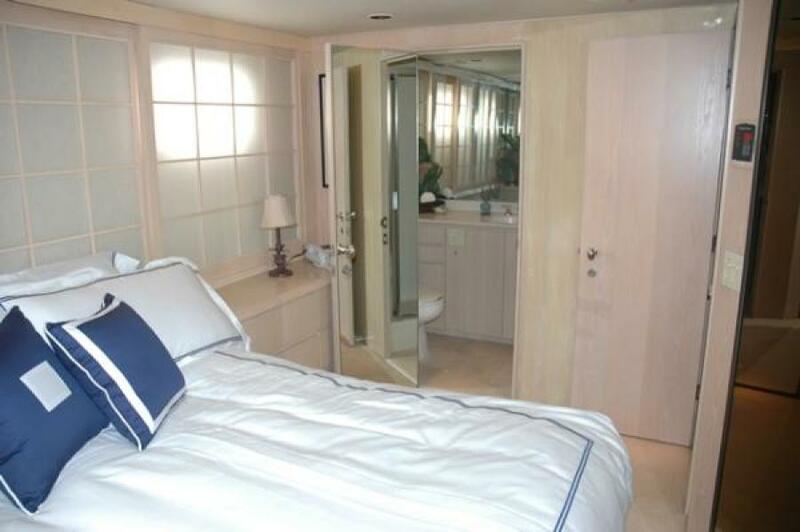 The privacy door to starboard leads to the on deck head, foredeck entry door starboard, pilothouse, dining salon, galley, and crew accommodations forward. The stairwell to starboard leads to the forward guest accommodations. 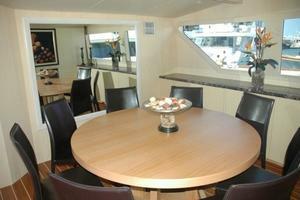 Forward on the main deck is the private dining salon. A circular table seats eight. The Traveltine marble covered buffet cabinet to port is perfect for serving. Large windows provide the ambiance. 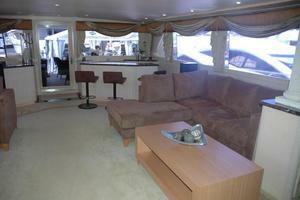 All the way forward on the main deck is the galley. 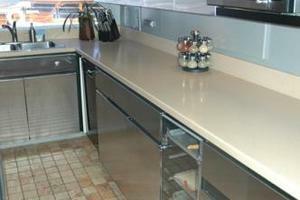 Stainless steel cabinets and Corian countertops provide a clean modern look. Plenty of storage and prep areas. Starboard side crew/galley entry door. Accessed from the port or starboard side companionways and up three steps, the pilothouse features a bench seat aft with storage drawers. The electronics are neatly installed in the console and very accessible. The master stateroom is accessed from the forward salon stairwell and is midship and full beam. 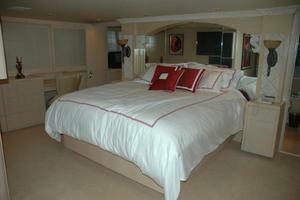 The king sized bed is centerline and forward and served by the night stands. Faux accents with scones and arch styled mirrored head board accentuate the room. To port is a makeup station and more storage. 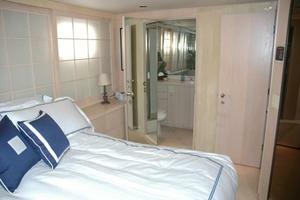 Forward to port is a doorway to the nanny/kid's stateroom, featuring an athwartship bunk and pullman berth over. Drawer storage cabinet. To starboard of the master bed is drawer and storage and a fabric covered L-shaped settee. A desk and chair provide office capabilities. 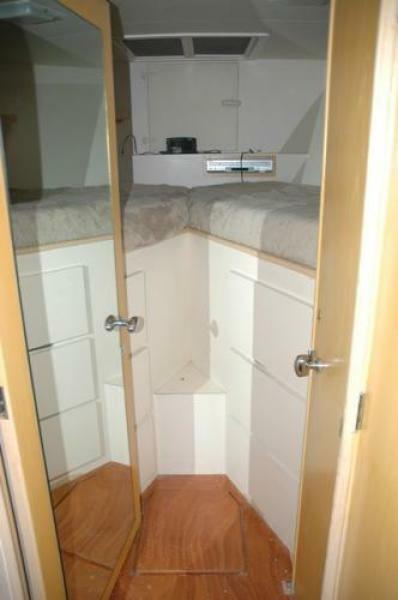 Further aft is a large walk-in and cedar lined closet. 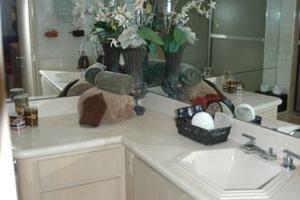 The master head is forward to port and has a tub and vanity. 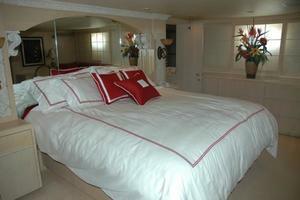 Located down the aft salon stairwell this stateroom features an athwartship queen berth with nightstands. The closet is aft. 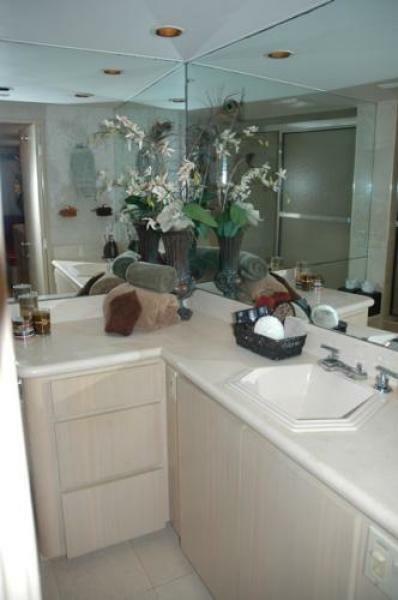 The private head is forward and has a stall shower and vanity. 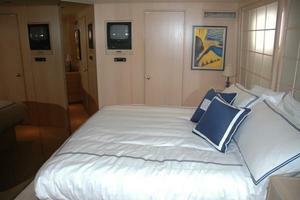 This stateroom has twin berths and an inboard pullman. 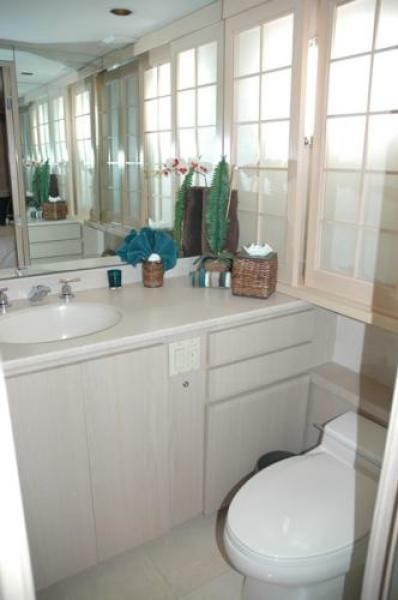 Closet aft with stall shower and vanity. The crew stateroom is forward. 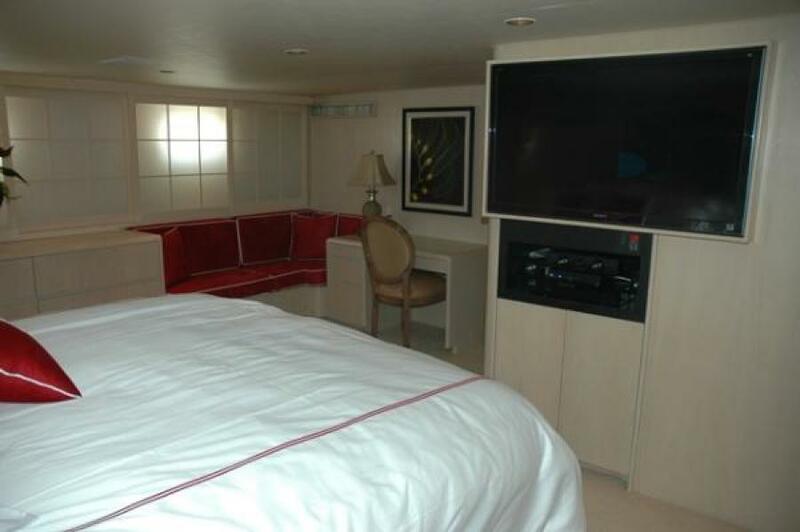 The V-berth stateroom has storage drawers and closet. 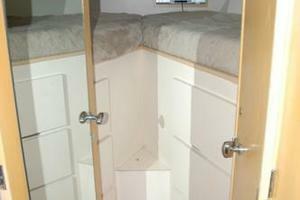 Aft in the companionway to starboard is a washer/dryer To port is the crew head with stall shower. 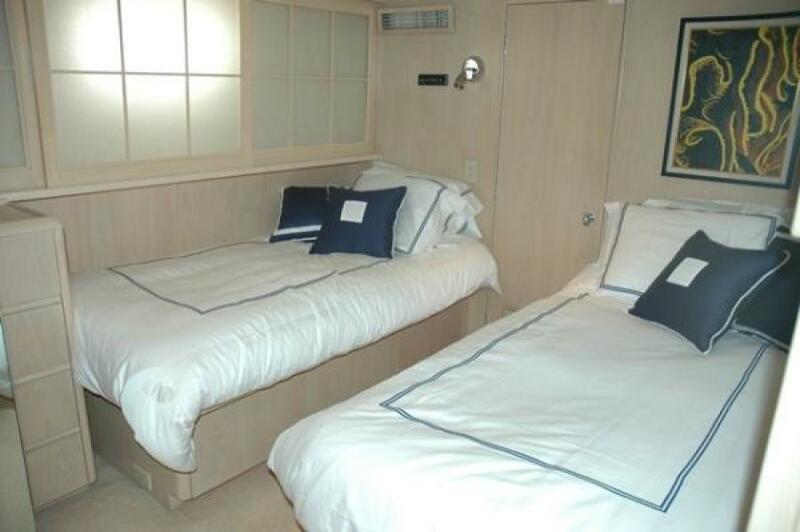 Further aft is a crew stateroom with over/under berths that are double sized. 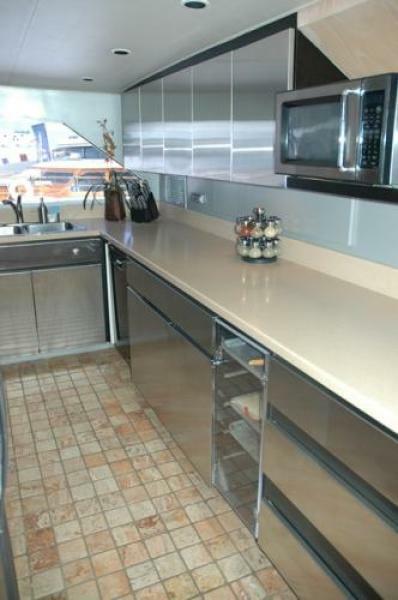 Opposite is a U-shaped dinette and crew storage area. Accessed from the Pilothouse or aft crew ladder, the flybridge has a bench seat/ combination cabinet at the helm. 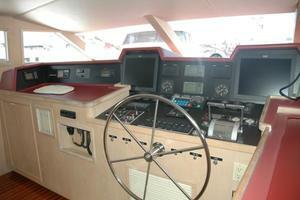 The helm has gauges and electronics in a console. Aft of the bench seat is the bar and preparation area. 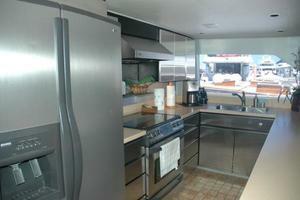 The cabinet houses a refrigerator and icemaker. 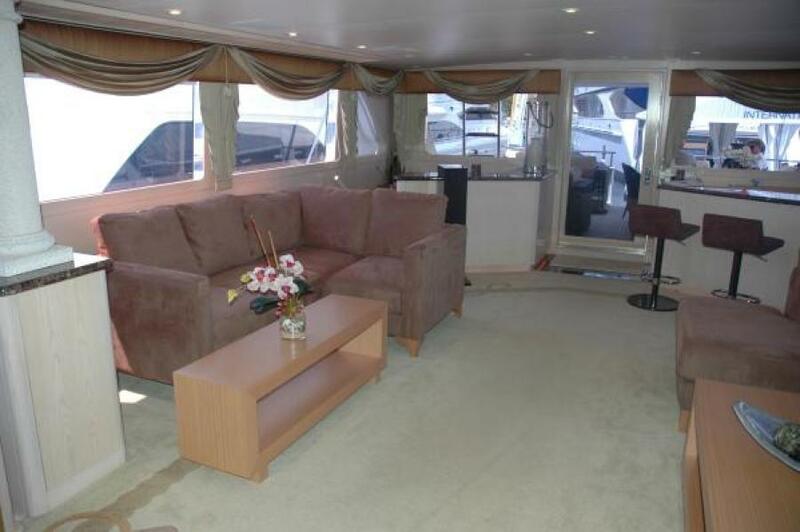 Along the port and starboard side is bench seating with storage underneath. 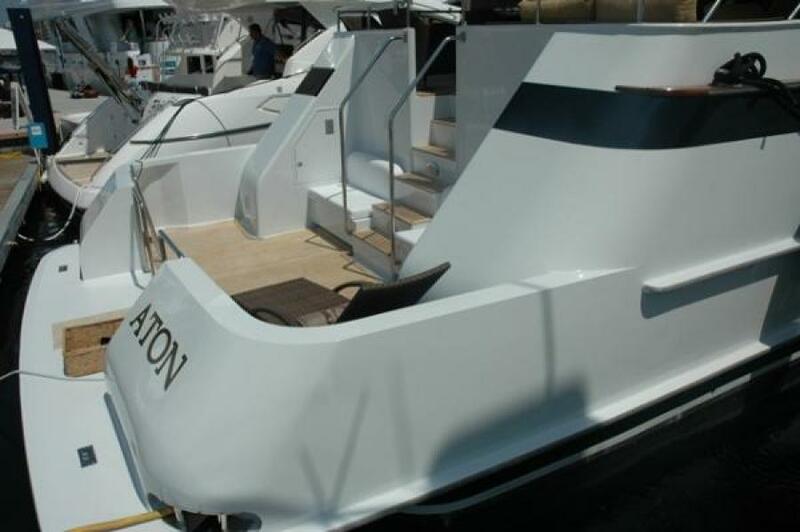 The entire flybridge is covered with a bimini top with a canvas attachment to the radar arch. Under the arch is space for a dining table. Aft of this area is the Queen sized sun pad with storage underneath. The dinghy is mounted athwartship leaving room for a PWC to be mounted alongside. The davit is located on the port side. 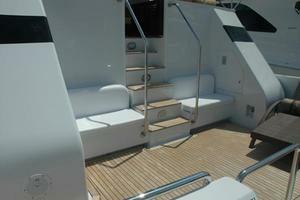 Crew access is through a covered hatch on starboard to the aft deck. 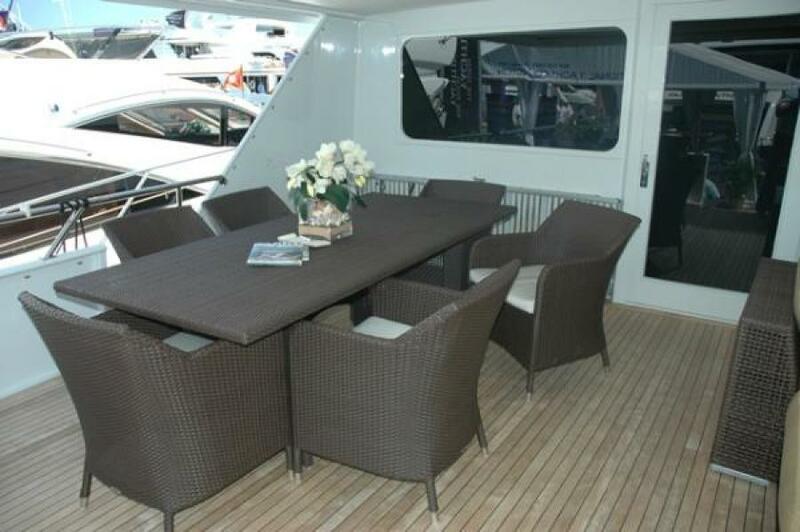 Accessed from the port or starbord salon doors, the foredeck has cushioned bench seat/lounge for anchor handling, observation and sunning. Escape hatch for crew. Varnished teak caprails run from bow to stern. ATON has a very large aft deck that allows for a dining area forward to port and a chaise lounge to starboard. Port and starboard access doors are forward of the port and starboard lounge seats. Teak decks enhance this area. 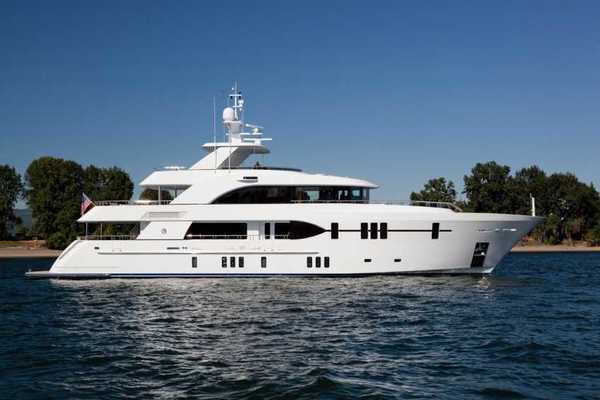 A five foot extension was added by Roscioli Shipyard. Covered in teak the aft bulwarks provide cockpit comfort yet an open configuration for ease of access. Stainless steel hoop rails accent this area. Bench seats are port and starboard against the transom bulkhead. Access lockers house shore power connections and a fresh water shower.